Modelworks Likamobile Kit's Three and Four. Kits 3&4 arrived on August 18th 2005. Opened boxes and check for damage, check parts against the parts inventory, no damage and all parts accounted for. Also the new stays were packaged with kit #4. See kit 1 notes, stays too short causing a chassis bow. Installed the new stays and the chassis is much better, thank you Modelworks. 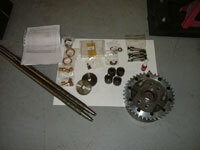 Now for kit 3 the differential assembly. 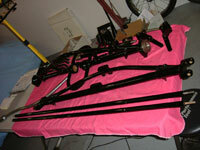 I layed out all the parts to become familiar with them and as to how the assembly was to go together. Read the directions carefully, several times, so you can picture the assembly in your head before you assemble. You will have to wash out the differential halves very thoroughly, mine was filled with machine fillings and chips, cleanliness must be stressed for this assembly. Assemble the bushings to the spur gears and arbors to the cases like in picture #4, but reverse the second half so the spur gears are staggered. Use a little oil and a light grease for this assembly. I'm going to jump ahead here just for a moment due to the fact that I discovered that the differential will leak, I added 6 ounces of 600 wt. 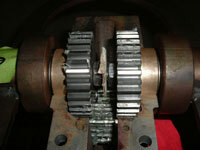 gear oil to my differential when it was completed and the oil leaked from the case seams as well as the arbor thru bolts. I chose 600 wt because this differential is identical to the original and with straight cut gears this heavy oil would be a requirement. I am going to recommend some sealants to prevent this problem. The machining of the parts is absolutely right on, and Modelworks should be proud but oil finds a way to not stay where its put. Back to the differential, all we want to do at this point is to figure out the amount of shims we need for the axles as explained in the instructions. So do not Locktite anything at this point. Leave the cog wheel off to one side for now, you did mark the left side of the rear axle with some masking tape and note: COG WHEEL THIS SIDE. I always make masking tape notes when I'm going to put something together more than once. 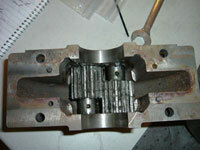 Don't fit the keys to the large side gears at this point, save this part for final assembly. It makes the assembly /disassembly a lot easier. 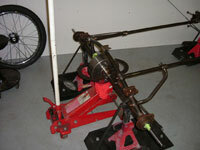 Assemble the axles as described, just a drop of oil on the bearings for now, it makes things easier. Now slide on the outer axle bearings and hold the bearing in place with some masking tape, this will allow the axle to be straight, spur gear perpendicular, better measurement in the end. Place the lower half of the differential onto the spur gears and brass bearing, I used a floor jack as my third hand as this will allow me to position the differential as it seats on the brass bearing and the spur gears. Pull the axles outboard so as to seat the inner bearings, I wedged a piece of cardboard between the two axle ends so as to help keep the axles always forced out board, push the outer axle bearings into their seats and tape in place. Try to center the differential in the housing as best as possible, put the other half onto the lower half aligning the pins, it may take a little moving of the axle, but it will seat right on, due to incredible machine work. Bolt the two halves together, I modified a 6mm Allen wrench in order to tighten these bolts. 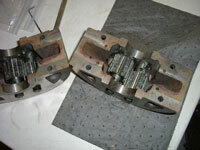 Now move the differential housing to see how much play you have as asked in the instructions. 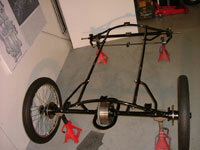 In the end I had to use 2 shims each side to have a zero movement. It took me 3 times to figure the shim requirement. 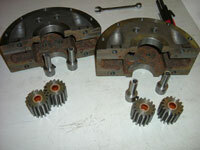 I dismantled the differential and axle assemblies, keeping the left side parts and right side parts separate. 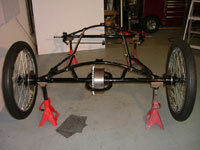 At this point I totally dismantled the entire chassis in order to send the parts out for powder coating. I used an outfit by me called Auto Body Contours, Preston and his brother did a great job and were quite enthusiastic about the steamer project. 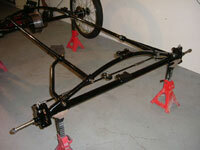 I picked up my parts from the powder coater, gloss black, how sweet it is. 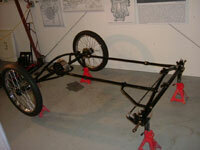 Reassembled the chassis for the final time. 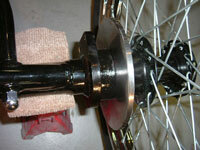 Using grease on the king pins, all the nylock nuts, etc. 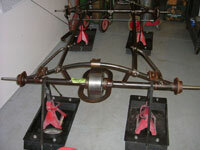 Now for the final assembly of the differential and axles. 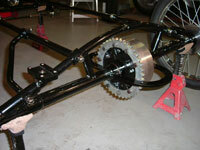 PLACE THE COG GEAR OVER THE LEFT AXLE HOUSING. Perform the keyway fitment to the side spur gears as described in instructions, I glued the shims to the tapered bearing, use glue sparingly. 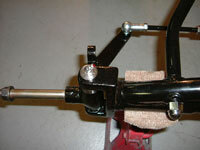 ( this will save you headaches from the shims not staying in place and getting caught on the axle shoulder). Pack the tapered bearings with a good quality wheel bearing grease and install both axle assemblies and tighten the axle nuts. I was only able to fit 1 lock washer as the axles are almost touching and there is not enough space to fit the second lock washer. 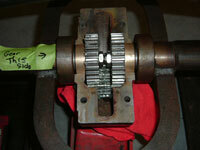 I used the Locktite on the threads and tightened the nuts securely. 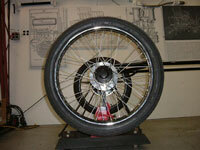 Now remove the small spur gear bolts, but don't let the gear/arbor assemblies shift. Clean the inside of the case hole with a wax/grease remover and apply a small amount of sealer to the hole, push the bolt through and apply sealer on the other hole. Tighten the bolt using the lock washer and some Locktite. Clean off any excess sealer and Locktite. The sealer I used is called: The Right Stuff, from Permatex, available at any auto parts house. Do this to all 4 bolts. Clean the differential halves mating surfaces with the wax/grease remover. Apply a thin layer of sealer, Permatex - 2A (non-hardening), also available at your local parts house, to the lower case half, install onto the axle assemblies. (again my floor jack as my third hand) Center the case half between the axle housings, push the brass bearing outboard of it respective side. 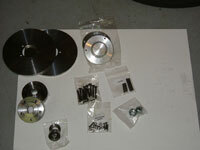 This will help act as a grease slinger for the inner axle bearings. 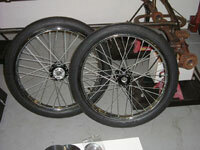 Apply a thin layer of sealant on the upper half case on the radius section only, this is where the brass bearing seats. Install the case half, and install the cap screws and nuts. Do Not use Locktite yet. Tighten the 4 cap screws/nuts evenly, this is to help force out the sealer. Repeat this tightening sequence several times and clean off any sealer that is squeezed out. When you feel you can't tighten the bolts any further and the seams are flush and tight, now one bolt at a time, loosen the nut and apply Locktite to the threads and retighten. Then repeat on the next bolt, do not loosen all 4 bolts at the same time. 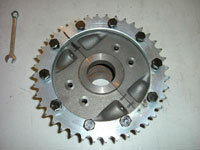 Install the cog gear using locktite on all the bolts except the 2 that will be used for filling the differential unit. You can use the Permatex 2A sealer on these bolts so as not to have any leaks. Follow instructions for Kit 4. I had to shorten my keys in order to fit the grooves in the axle, and had to take about 2mm off the top half of the key at the bearing, because the key would interfere with the bearing inner race and not seat properly into the axle shaft. A little bit of filing on the hub keyways was necessary in order to have a nice snug fit. I assembled the balance of the kit without any other fitting. The clearance of the hub to the axle housing is tight, mine was about .002 inch. There is probably more, but the powder coating takes up space as well. 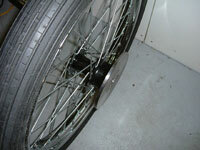 This will also help keep the dirt out of the axle bearing. Again, Modelworks machining and attention to detail is paying off. Now for that well earned brew or two, to admire my handiwork. 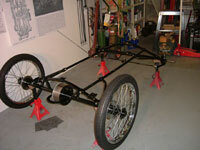 The wheels turn smoothly and the differential is working well without any binding, just one slight tight spot, but this will work its way out with some use. 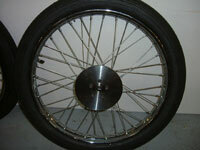 Also note the wheels will not spin very freely due to the fact of the freshly packed bearings. I had some chrome Acorn Nut covers left over from a Ford flathead engine I just finished, so I put them on the chassis nuts. They looked real nice against the black chassis. Now that I've completed the first 4 kits I am quite pleased with the quality of the parts and the machining, and quite confident that Modelworks will be providing only the best for our future installments. The instructions are not written for the novice, and in a lot of instances the instructions assume the builder is automotive knowledgeable. Kit 3 was a challenge, which of course is half the fun. I've fielded a number of calls from fellow builders on kit 3 and hope I was able to help them. But please remember this is more than a model, it is an automobile that will be driven on the streets with other automobiles. Always think safety first, and when in doubt ask someone who knows. 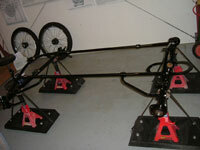 Modelworks already has a prototype and should be able to answer any questions through their tech support. 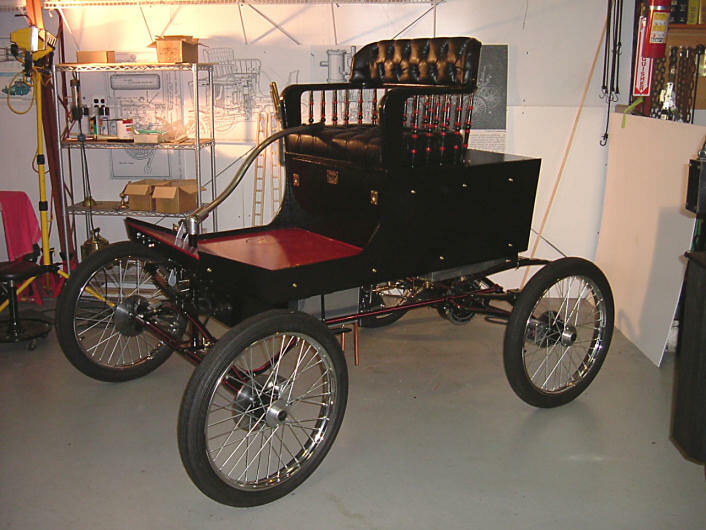 I hope you are enjoying this Locomobile project site. I look forward to hearing from other builders and how they approach their project. Yo! Simon, where's the next kit, now I feel like a fish on the hook. Kit Four B and Five. 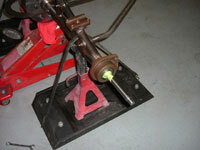 Brake Pedal, Brake Line, and Throttle Pedal Installation Fuel Line Pickup Modification. Super Heater, Hand Pump, and Plumbing. Some Final Assembly and First Time Steam Up. Road Test and a few Modifications. Locomobile Cylinder Drains July 2009.